I haven’t posted on my blog for ages, so long in fact that I’ve forgotten how. This morning I found myself eating marmalade straight from the jar with a spoon and savouring the flavours; a fresh citrus hit with a tangy aftertaste. I could smell the light scent of cardamon from the jar, but should it perhaps be stronger in the syrup? Savouring and ruminating. The overall result was a good one creating an instinctive response to down another spoonful. So it seemed a fitting time to share the recipe. I have deemed this preserve a success and love the idea that others will enjoy it too. Last week my quest for new season citrus gave the perfect excuse, in case one were needed, to treck off to Monmouth to see what Munday & Jones, my favourite local greengrocers, had to offer. They did not disappoint with a crate of blood oranges and some super perky looking early Yorkshire rhubarb on sale, the colours of which were enough to instantly lift my heart, but then I am after all a fruit geek. I decided to make a marmalade that is a variation on a previous recipe from 2011, pink grapefruit, rhubarb and cardamon marmalade, simply substituting blood oranges for the ruby grapefruit. Yorkshire rhubarb doesn’t come cheap, so this is a good recipe to make a small amount go a longer way. It also meant I had a few sticks left over to make an upside down polenta cake as well. As I mentioned, I am still undecided whether the cardamon could do to have a bit more impact. I freshly ground the spice in a pestle and mortar, placing it pods and all in a muslin bag to macerate with the rhubarb. Perhaps the cardamon I have could be fresher, who knows? I might buy some new for next time I make this marmalade. But still, too much cardamon would not be good either. It is always a very exacting thing when using spices and herbs in preserves, but better to underdo than over. Of course the ideal is to get it bang on! Rinse the rhubarb stems and chop into 1cm (1/2 in) evenly sized pieces, slicing thicker stems lengthwise to make the pieces uniform. Place them in a bowl with the sugar and lemon juice. Tie the crushed cardamom seeds, pods and all, in a piece of muslin and push them inbetween the rhubarb, then cover with baking paper or clingfilm and leave overnight or for up to 24 hours, so the juices ooze out of the rhubarb and turn the sugar to syrup. 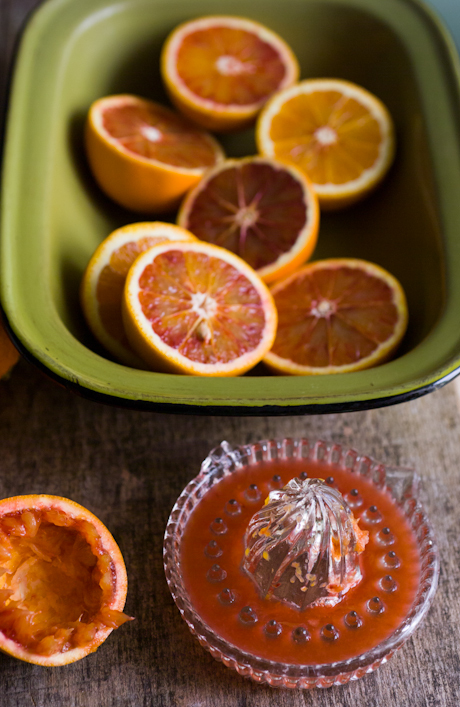 Wash the blood oranges and remove the peel with a sharp knife or potato peeler, leaving as much of the pith on the fruit as possible. Finely cut the peel into shreds. Squeeze the fruits, collecting the juice and tie the remaining pulp, pith and pips together in a muslin bundle. Place the shreds, juice and bundle in a pan, add 1.4ltr (2 1/2pt) water and simmer for 2 – 2 1/2 hours until the peel is cooked through and tender. Remove the muslin bundle and, when cool enough to handle, squeeze the juice from it back into the pan, then discard. Pour the peel through a sieve and collect and measure the liquid, adding more water if necessary to make it up to 1ltr (1 3/4 pts). Prepare the jars and canner if you plan to hot water process the marmalade, otherwise, make sure your jars and lids are clean and place them in a warm oven to heat and sterilise. 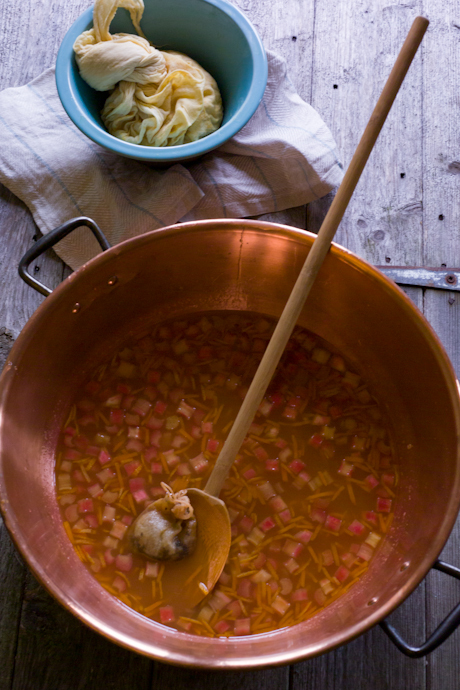 Place the cooked shreds, cooking liquid and the contents of the rhubarb bowl in a preserving pan and bring slowly to the boil, stirring to make sure all the sugar is dissolved. Bring to a rolling boil and cook on a high heat until setting point is reached, that is when a small blob of the syrup on a cold plate quickly forms a skin when you run your finger across the surface. It took me 20-25 minutes for the marmalade to reach setting point at a fast rolling boil, showing 104C (220F) on a thermometer. Remove the cardamom bundle. Fill the jars, leaving the appropriate amount of headroom for canning, and seal. Hot water process for 10 minutes, then remove from the canner, leave till cold and test that the lids are sealed. Label and store. Alternatively, without canning, top jars with sterilised lids or use traditional wax paper circles and cellophane with elastic bands to seal. 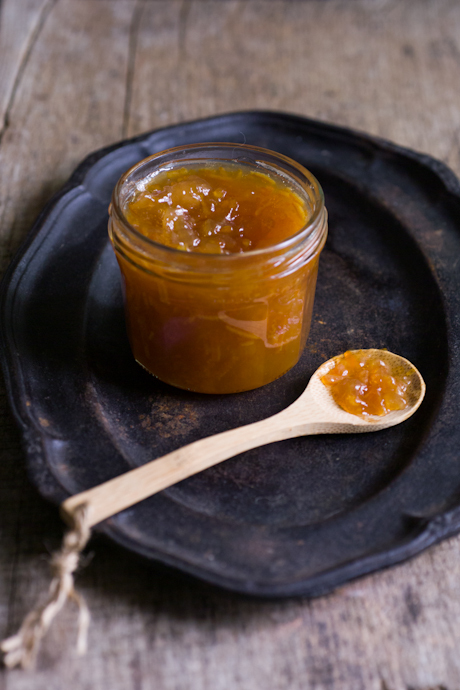 This marmalade should store safely without canning, but hot water processing will make doubly sure that your jam will keep and store without a hitch.